Patch.com, the venture-capitalized, Google-zillionaire-backed startup that recently launched town-specific news and information websites in Maplewood, South Orange and Millburn, today announced plans to expand into an additional three nearby communities. The newest Patches are slated to open in May in Summit, Westfield and Scotch Plains (including Fanwood), all in Union County. Summit is contiguous with Millburn in Essex County, but Westfield and Scotch Plains/Fanwood are further south, separated from the other Patches by Route 22 and by the towns of Springfield and Mountainside. 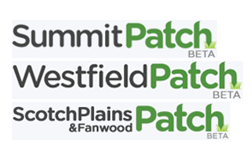 Each of the new Patch towns are served by local newspapers, and Summit even has SummitNJ.net, a sister site of the venerable Maplewood Online. Even after the new sites open, however, none of the towns will have an online presence to rival the Maplewood BlogolopolisTM, which is served by five separate, general-interest websites. This entry was posted in Uncategorized and tagged Maplewood, MSM, Patch, Social Media by Kirk Petersen. Bookmark the permalink. Kirk, I responded with a rather long commentary that now seems to have gotten lost. I’m too tired to repeat it, but in a nutshell, I’m worried about the future of small little ventures like my friends are trying to startup in Metuchen (MetuchenMatters.com). They’re working very hard, for no money, and doing a good job of covering what the local press ignores. I’d hate to see them have to face Googliath! Sorry you lost your post… Blogger is buggy sometimes. I’m planning to migrate to WordPress soon.